Don’t let your dental benefit slip through your fingers! Contact us to speak with an office team member who can check if you have any 2018 benefits remaining. If you do, schedule an appointment as soon as possible to begin or finish any needed treatment before 12/31/2018. Call us right away — our autumn schedule is filling up fast! You and/or your employer pays the premiums for your dental insurance all year. Most plans provide between $1,000 and $1,500 of coverage, but some provide even more. By not completing treatment by the end of the year, any benefits that you have remaining will disappear forever. It’s a “use it or lose it” situation. You can schedule treatment now to make sure you get the most out of your remaining 2018 benefits. Many dental procedures take place across multiple appointments, so getting such processes started now can help to maximize your dental coverage. Our team at Abington Family Dental Care will work with you to ensure that you take full advantage of your coverage and pay as little as possible out of pocket. Funds in a flexible spending account (FSA) may not roll over to the following year. If you’ve contributed money to your FSA this year, you can use it toward dental care. Don’t let it expire! Getting preventive care done by the end of the year may save you money. Many dental insurance plans cover cleanings, X-rays, and exams at 100% with no out of pocket cost to you, but such services still count toward your annual maximum. Schedule overdue preventive services this year, and you’ll save the full amount of your benefit for any advanced treatment you may need at the beginning of next year. A few plans come with a “rollover period” that allows you to use your benefits in the following year, but it is usually a reduced amount that gets carried over. You’ll still sacrifice the opportunity to truly get the greatest value out of your insurance benefit. Healthcare and dental costs are significant to most families. 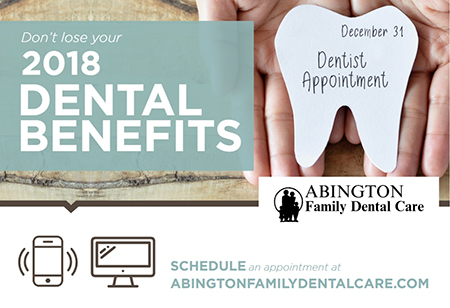 Schedule an appointment today to get the maximum out of your 2018 dental benefits that may expire on December 31, 2018. Also be sure to take advantage of any unused FSA or healthcare savings account (HSA) funds that you may still have remaining. The end of the year is approaching quickly, so book now and let us do our best to maximize your insurance. Speak to one of our staff members today to verify your coverage and confirm your remaining benefits.